Great job on the cake! Even with Confetti Cakes, my cake decorating is seriously lacking. Yours looks wonderful. Sounds like a great day! 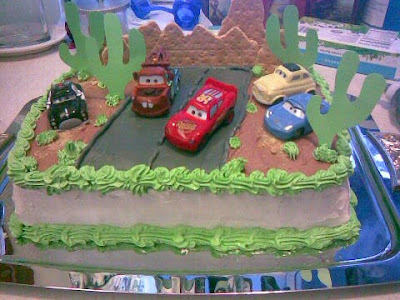 I know Logan will love his cake. The cakes in Confetti Cakes for Kids are unbelievable - if I made one of those, I'd dare anyone to eat it! Happy Birthday, Logan, and Merry Christmas! I'm always jealous of people that can make cakes like that. Gorgeous. Have a great holiday! Wow, the cake looks great! I almost don't believe it's homemade, it looks too good! And Happy Birthday to your son! My dad's birthday is on Christmas day, and I remember he used to feel sad when he was young, that no one believed him when he said it was his birthday party and not just a Christmas party, and he never felt special because everyone was getting presents too. =( I'm glad you don't let your son feel that way, he must feel really special with a cake like that! Thanks for visiting my blog! Merry Christmas! A very happy birthday to your son! Our Grandboy will be 2 on the 30th, so we know what a magical age it is and what life is like with a two-year-old. Enjoy your holidays and stay warm! I think it looks fabulous!! Happy Birthday to your boy and Merry Christmas to you and your family! Oh my! I just saw the absolutely cute pictures of your baby with Santa - I LOVE IT!!!!! The cake looks great Wendi! Hope the birtday party was lots of fun and the holidays as well! Thanks for the pics! Happy birthday, Logan! What a gorgeous cake! Hope you had a wonderful Christmas. I hope Logan's bday was happy and that you and your family had a very Merry Christmas!